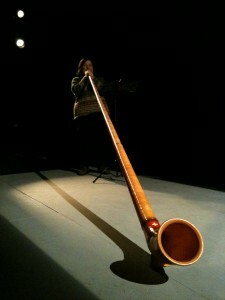 Live alphorn music at the 2010 festival stop in NYC. Photo by Chris Casciano. The Banff Mountain Film Festival World Tour makes two stops in our area thanks to Chestnut Mountain Productions next month and tickets are starting to go on sale. If you’re attending the film festival, say hi in the comments section and I’ll look out for you. This entry was posted in Event and tagged arts, Banff Mountain Film Festival, environment, film, film festival, New York City, outdoors, Suffern. Bookmark the permalink.